Budapest is a city with fantastic buildings, and an amazing panorama as you walk along the Danube. But, one of the most fantastic places to walk around is in the Grand Market Hall, at least if you have a kitchen you can use afterward to prepare some royal meals. The Market Hall is a melting pot in Budapest. Here you can see old ladies with their trolleys, buying whatever they need for the day. Next to them, you will meet a group of 30 Japanese tourists taking photos, while a local chef heads towards his favorite seller for some fresh meat for the daily menus in the restaurant. Here you can find all sorts of people, at all ages, from all around the world. 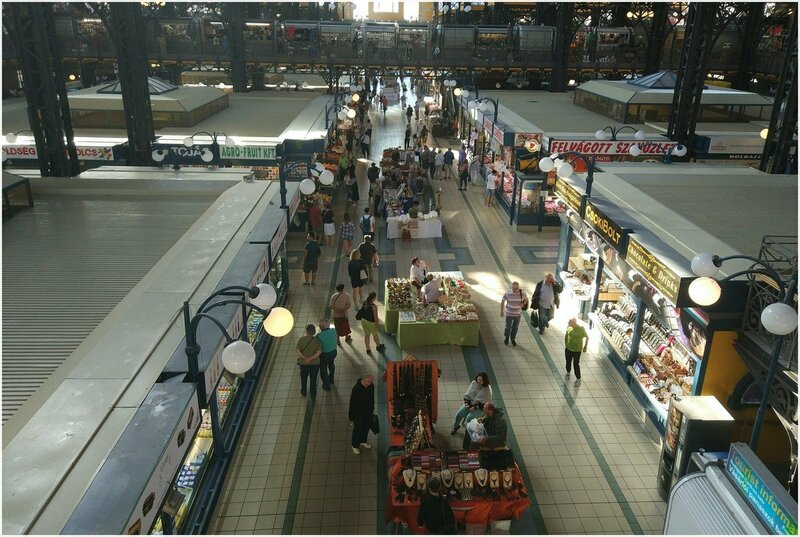 Last week I had the chance to walk around in the Grand Market Hall in Budapest. It is located in the city center of Budapest, at the very end of the shopping street named Vaci utca. The market hall opens at 6.00 in the morning, to make sure that those eager to prepare lunch before eating their breakfast, can get fresh meat and vegetables before sunrise. But, what can you actually find inside the Grand Market Hall? 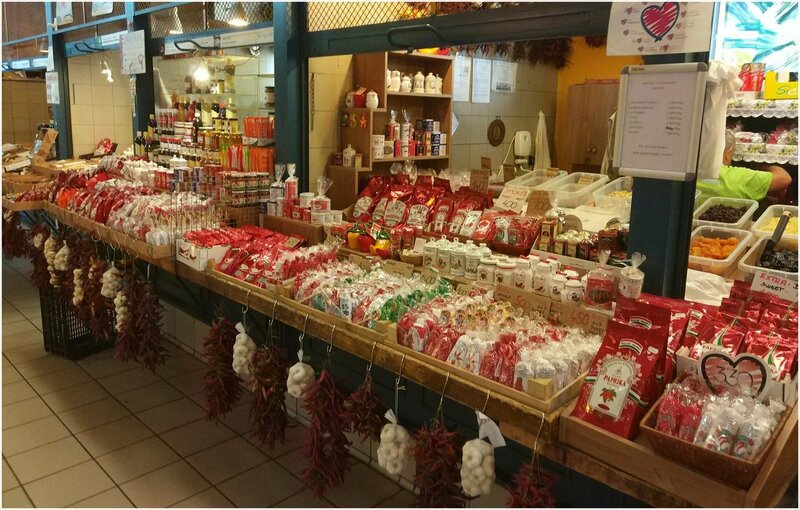 Join me on this little culinary walk in the Grand Market Hall of Budapest. The first thing that hits you as you enter the building (and look at it from the outside), is that it reminds you of a railway station. Lots of persons actually believe it is a railway station, but end up deeply surprised after actually entering the building. 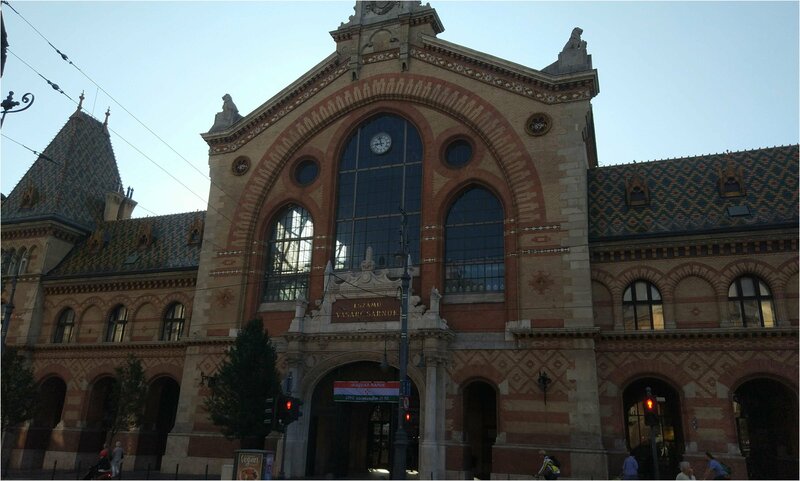 The Grand Market Hall was only one out of five market halls that were built in the capital of Hungary at the end of the 19th century, but this is the most famous and popular of them all. The Grand Market Hall has a basement in which you can find a grocery store, a meat store, and some small places where you can buy fish. The locals, however, spend most of their time on the ground floor, while tourists (especially women) walk around on the first floor. At the ground floor, you can find fruits, vegetables, and meat. 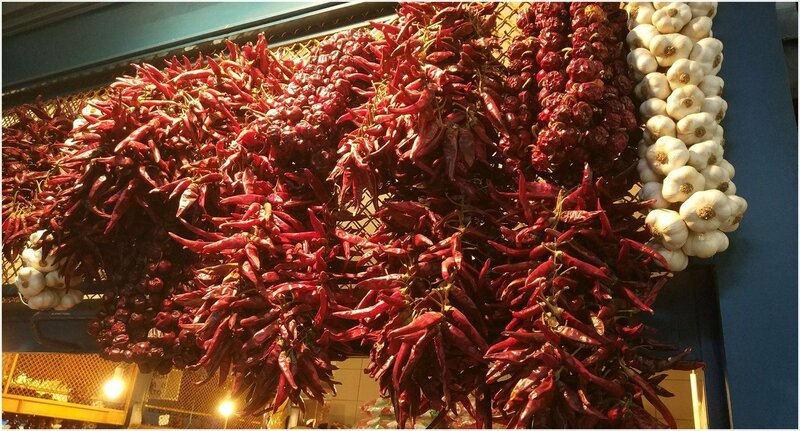 One of the first things you will see (depending on where you enter), might be lots of Hungarian paprika. At the picture beneath you can see the Hungarian paprika in all sorts of shapes. You will often notice that Hungarian food has a red color. It might be a soup, a sauce, or a stew, but the red color normally comes from using the Hungarian paprika. In the market hall, you can buy it as a powder (ideal for use in soups, stews, and sauces). But, you might also buy the real paprika, but that is often used as a decoration, and not so much for actual cooking. One of the coolest things to bring home from the Grand Market Hall is a glass with paprika-stew, named Erös Pista (Strong Stephen). Add a teaspoon of this to your food, and it will give a strong Hungarian taste to your food. If you want to have a nice lunch, then you shouldn’t forget about the dessert. But, no need to worry. 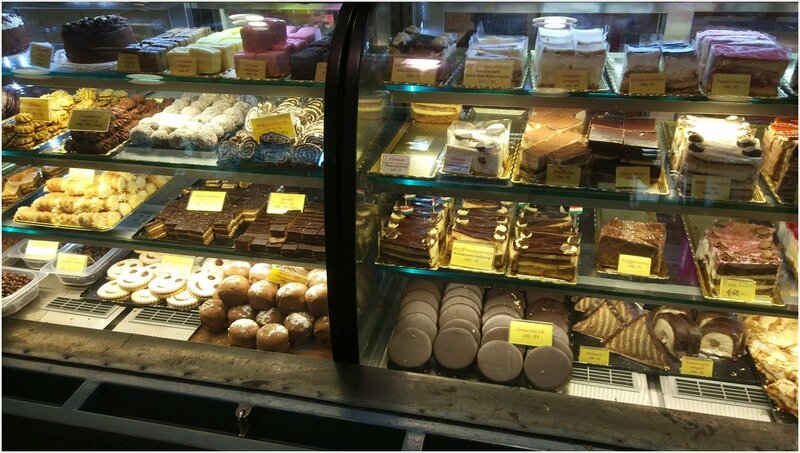 You can find lots of dessert solutions in the market hall. At the picture above you can see some of the most traditional Hungarian cakes, including the round biscuit covered in chocolate, with jam in the middle, the so-called Ischler. Would you rather eat some hand-made chocolate for dessert? 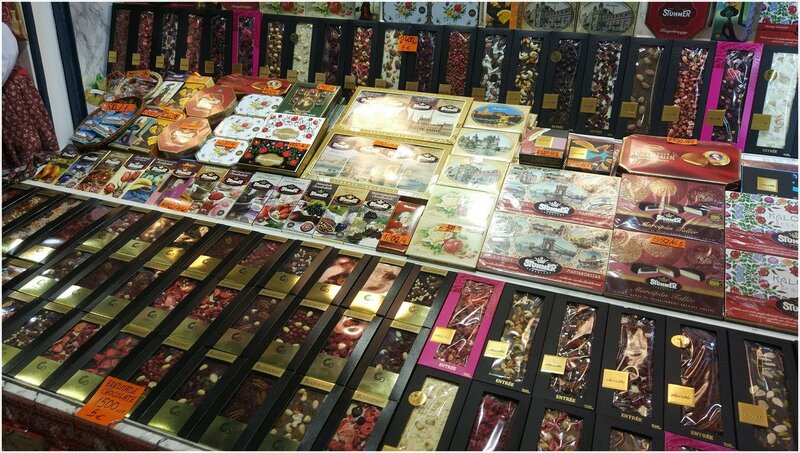 There are lots of chocolate with all sorts of spices and extras in the Market Hall. 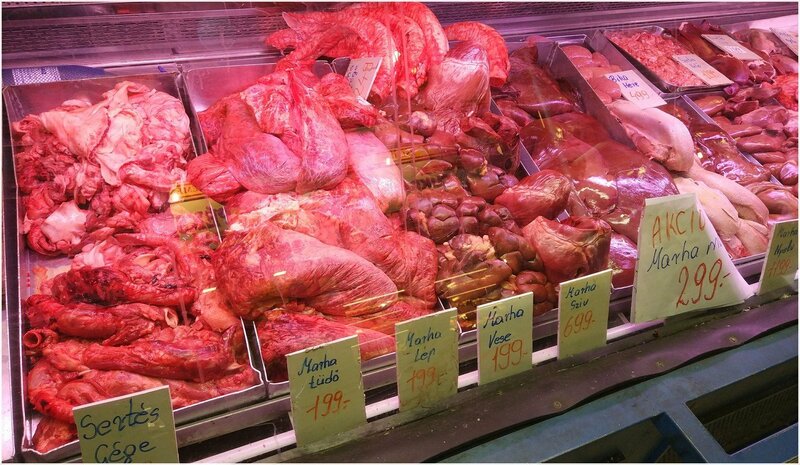 If you are a meat-lover, then you will find all sorts of interesting meat in the market hall. You can, of course, find traditional meat like chicken wings, chicken breast, minced meat, steaks, and so on. But, you will also find more interesting pieces like the ones you can see on the image beneath. There you can see larynx from a pig, cow interiors like lounges, hearts, kidneys, spleen, and other delicious stuff. Besides these, you can also find testicles, tongues, ears, and other culinary exotic objects, so get ready for cooking! Would you rather buy some Hungarian sausage, salami, or maybe some liver paste? 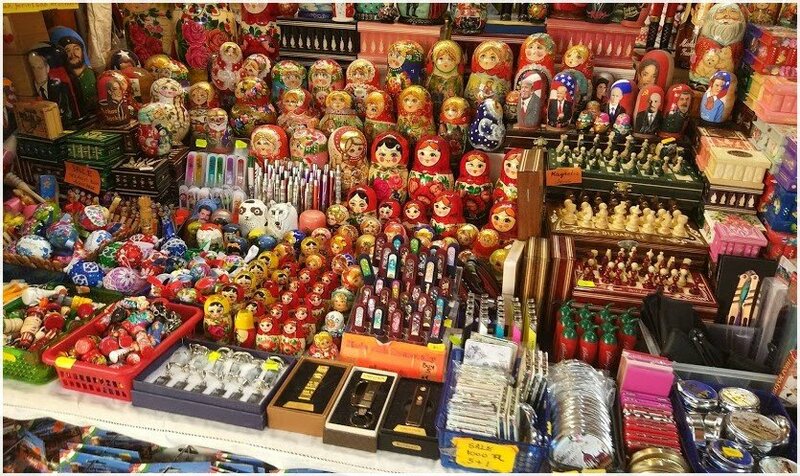 You can buy such objects as you walk around inside the Market Hall. It might not be as exotic as the meat portrayed above, but it is easier to prepare, and maybe also digest for some of those with a faint heart and scared of eating interior parts of animals. Hopefully, the vegetarian readers of this blog still read the article, because now comes the part they might prefer. 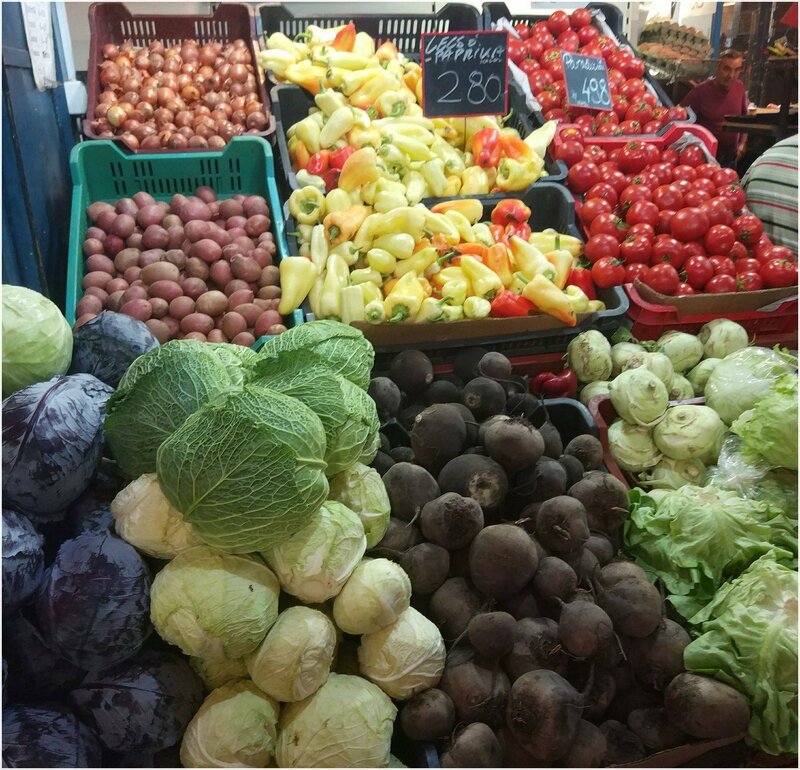 Hungary is a nation of agriculture, meaning that there are fresh vegetables and fruits available throughout the year, at very nice prices. Maybe you want to enjoy a fruit salad before continuing your walk? 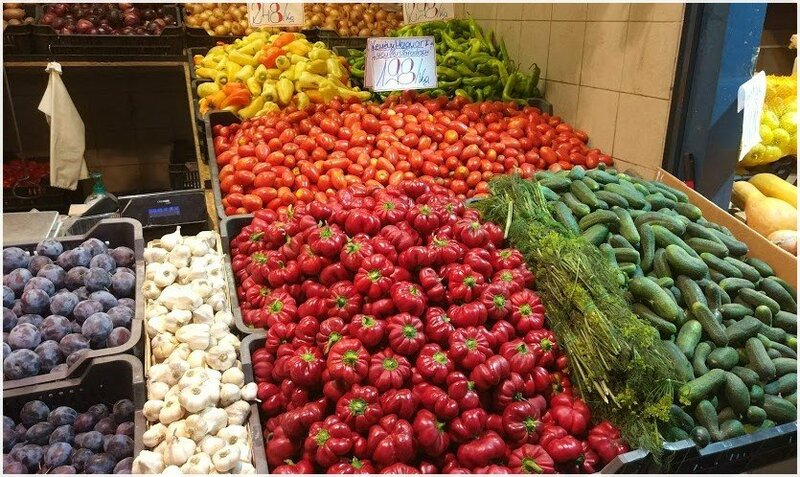 You can easily buy such a salad in the market hall, and you can also find places, where you can buy fresh, pressed orange juice and grapefruit juice if that sounds good. Would you like to drink raw juice? There are lots of vegetables ideal for juicing in the market hall. But, you can, of course, buy some beetroot and create a creamy soup with it instead? Or maybe buy a cabbage to create the traditional Hungarian stuffed cabbage? 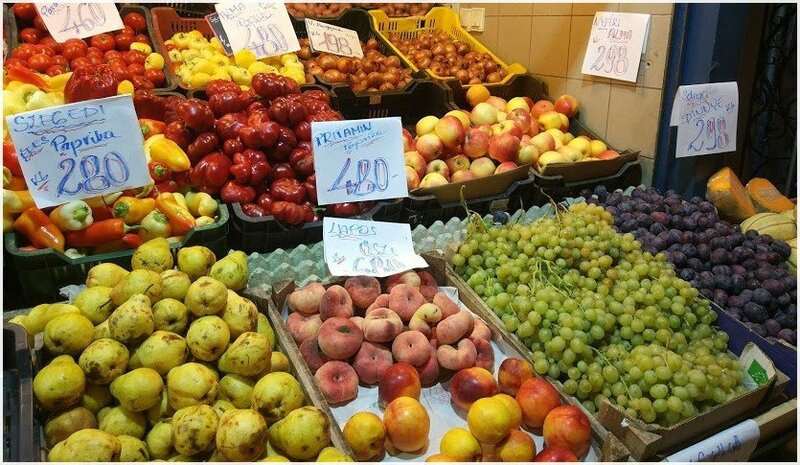 There is a lot of fruits available in the market hall, and they are sold at great prices. During harvest season, this is one of the cheapest places in Budapest to buy watermelon, grapes, strawberries, raspberries, peach, apricot, pears, apples, plums, and other juicy fruits. You might not bring with you several kilos of fruits as you leave Budapest, but you should absolutely eat some kilos of fruits while in Budapest! You can also buy dried fruits in the market hall, making it even easier to digest fruits while walking the streets of Budapest throughout the day. Would you rather buy some fresh seeds, peas? Everything is possible in the market hall! We have just been walking around the ground floor of the market hall in Budapest, but there is much more to see (also on this level). But, maybe you have gotten tired and want to take a break and grab something to eat? Let us visit the second floor to see what it has to offer! 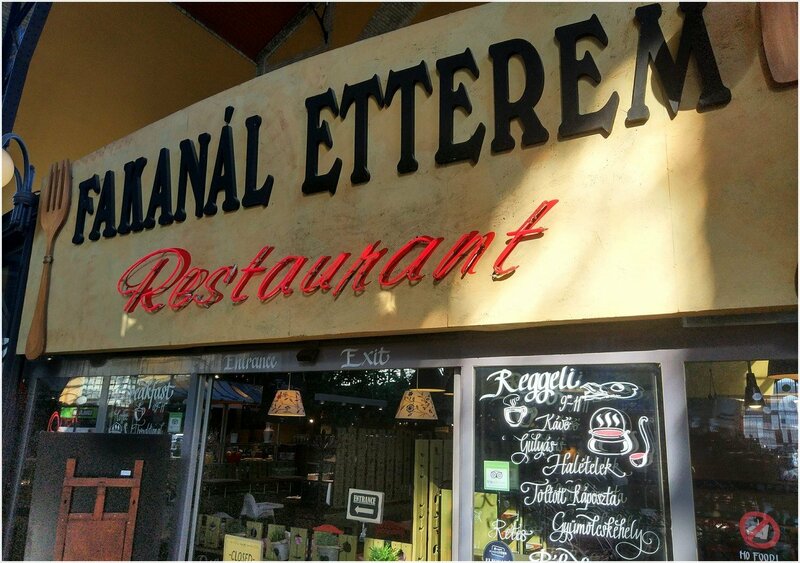 The most popular place to eat in the Market Hall is in the Fakanal restaurant on the second floor. Here you can eat in a very traditional environment (typical red/white tablecloth), and you are served all sorts of traditional dishes. If you want to taste Hungarian fruit-spirits (Palinka), that is possible as well in this restaurant. As I mentioned earlier, the second floor is where most tourists spend their time in the market hall. 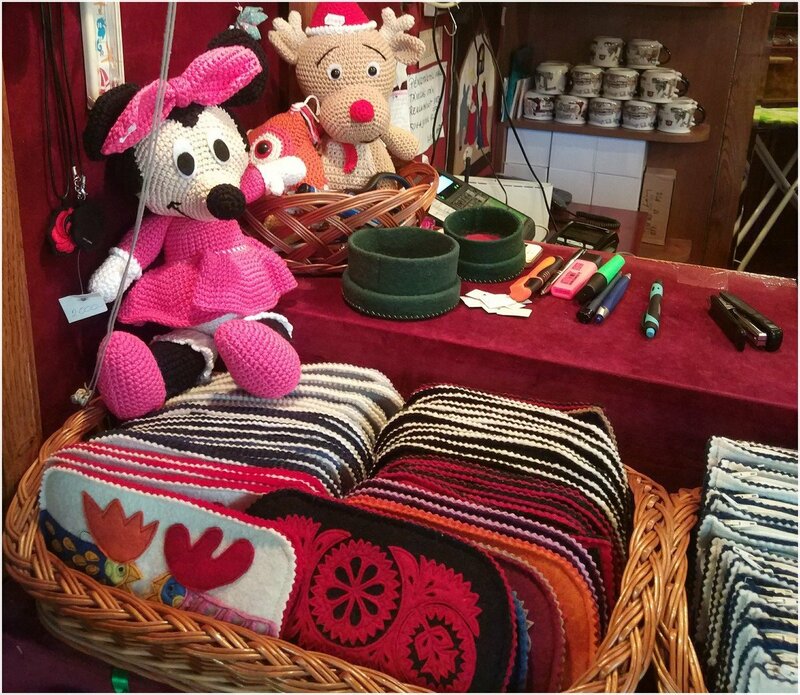 Do you need to buy some souvenirs that you should bring home to your kids or some other family member? This is the floor in which that can be done. Does a typical Russian doll (a matryoshka doll) sound interesting? You can find them with all sorts of motives, making it a possible funny gift to bring with you home. Maybe you want to buy a chess board instead? There are handmade chess-tables waiting for you on the second floor, as well as keyholders and other small objects. But, what is it that most ladies prefer to buy in the Grand Market Hall? The number one answer in Budapest is table clothes. These are (mostly) hand-made, and they are either clean white or made with typical Hungarian colors. These are very popular, and a gift many bring home to their elder family members. The only problem is that most people fear to use them, as they are afraid to spill on them. 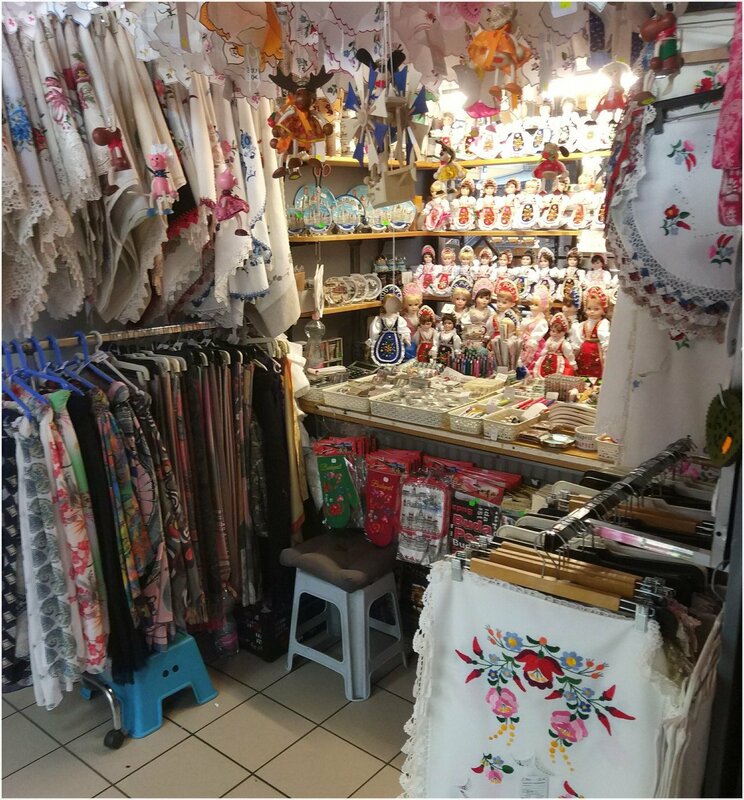 For that reason, lots of people have 3-4 similar table clothes in their cupboard at home already, but still, they manage to buy at least one more during a visit the to Market Hall in Budapest. 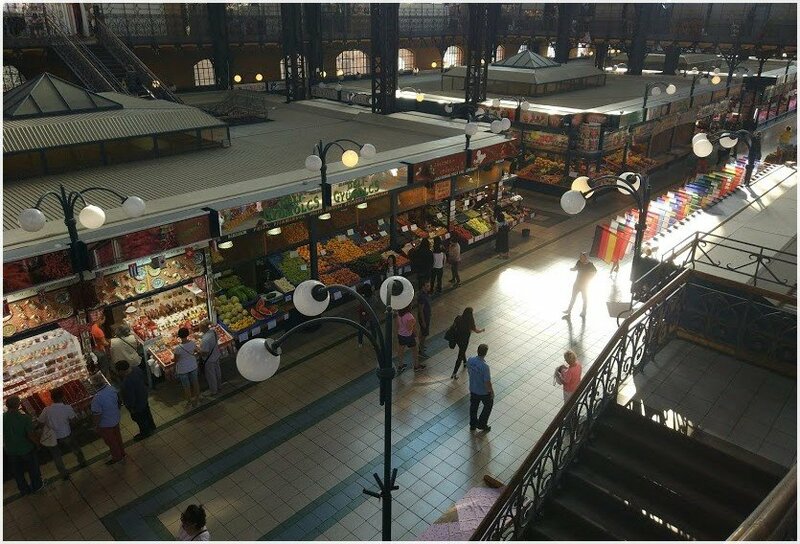 I hope you have enjoyed this culinary walk in the Grand Market Hall of Budapest. It is an amazing place everyone should visit, and if you have a kitchen available during your stay in Budapest, it is even better! 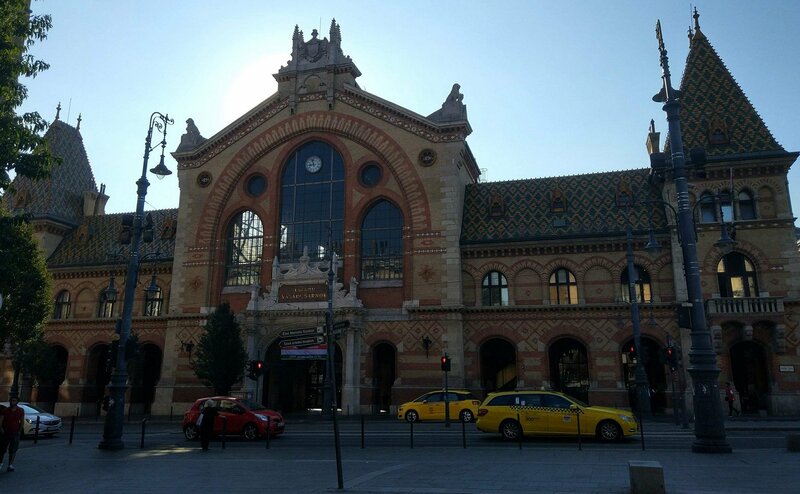 Have you been to the market hall in Budapest? Did you enjoy it? I would love to hear your thoughts and comments! Grillmania in Budapest – Worth a visit? ← Visiting Diósd outside Budapest? Where to eat?